A United Nations forecast of the possible movement of the radioactive plume coming from crippled Japanese reactors shows it churning across the Pacific and touching the Aleutian Islands on Thursday before hitting Southern California late Friday. The projection, by the Comprehensive Test Ban Treaty Organization, an arm of the United Nations in Vienna, gives no information about actual radiation levels but only shows how a radioactive plume would probably move and disperse. The forecast, calculated Tuesday, is based on patterns of Pacific winds at that time and the predicted path is likely to change as weather patterns shift. 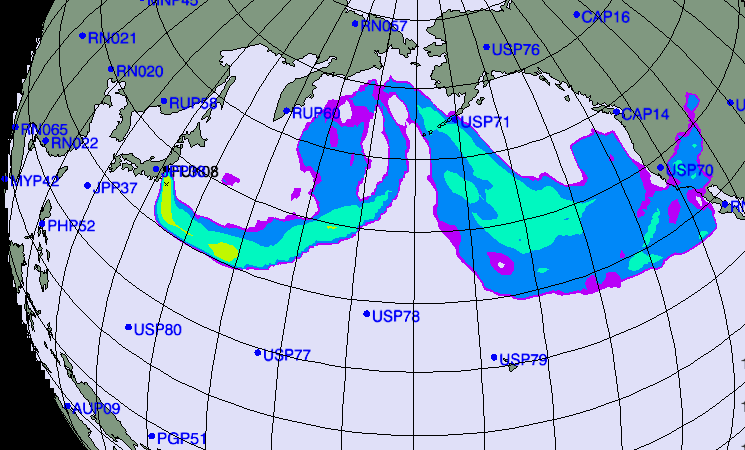 The Japan forecast shows that the radioactive plume will probably miss the agency’s monitoring stations at Midway and in the Hawaiian Islands but is likely to be detected in the Aleutians and at a monitoring station in Sacramento. The forecast assumes that radioactivity in Japan is released continuously and forms a rising plume. It ends with the plume heading into Southern California and the American Southwest, including Nevada, Utah and Arizona. The plume would have continued eastward if the United Nations scientists had run the projection forward. The chairman of the Nuclear Regulatory Commission, Gregory B. Jaczko, said Monday that the plume posed no danger to the United States. “You just aren’t going to have any radiological material that, by the time it traveled those large distances, could present any risk to the American public,” he said in a White House briefing. In Germany on Wednesday, the Federal Office for Radiation Protection held a news conference that described the threat from the Japanese plume as trifling and said there was no need for people to take iodine tablets. And keep in mind that iodide only protects against one particular radioactive element: radioactive iodine, technically known as iodine-131. Iodine-131 has a half life of only 8.02 days. That means that the iodine loses half of its radioactivity within 8 days. In contrast, plutonium has a half life of up to 80 million years, and is one of the most hazardous substances in the world. Fukushima reactor number 3 burned a plutonium-uranium mix, and has lost containment. Therefore, Americans will likely not be exposed to any plutonium. Likewise, uranium is heavy and cannot be blown very far by wind. Other possible radioactive elements from Japan include some elements - like radioactive nitrogen (with a half life of seven seconds) - decay so quickly that they could not possibly make it to the U.S. in radioactive form. Cesium-137 is light enough to be carried by the wind a substantial distance. But this is still largely conjecture, as neither the government or private sector scientists have yet publicly disclosed the exact radioactive elements headed towards the U.S. The Environmental Protection Agency says that everyone in the United States is exposed to very small amounts of cesium-137 in soil and water because of atmospheric fallout from the nuclear detonations of the cold war. The Swedish official, research director Lars-Erik De Geer of the Swedish Defence Research Institute, was citing data from a network of international monitoring stations set up to detect signs of any nuclear weapons tests. Also stressing the levels were not dangerous for people, he predicted particles would eventually also continue across the Atlantic and reach Europe. "It is not something you see normally," he said by phone from Stockholm, adding the results he now had were based on observations from earlier in the week. But, "it is not high from any danger point of view." De Geer said he was convinced they would eventually be detected over the whole northern hemisphere. "It is only a question of very, very low activities so it is nothing for people to worry about," De Geer said. understatement of my life: THANK YOU. for everything. How do you reconcile this post with other posts you have made about how the US government uses fear as a tool to keep it's own population passive etc etc? "Much of the particulate pollution over Los Angeles originates in China, according to the Journal of Geophysical Research." Wow, nuclear disaster in the East.? Didn't Nostradamus mention something like this not too far back in his day! GW, here is a link to a private radiation network in the US that is first reporting of a radiation cloud detected at Bakersfield, Ca. This is so ridiculous, secret and irresponsible that the government is not tracking each cloud by satellite and reporting on how much radiation is contained in each cloud. Is this stupid or what, how many geology departments are there in the US that has Geiger counters? All they have to do is turn them on and report their readings.